Congenital lobar emphysema (CLE) is a rare anomaly of lung development which is usually unilateral. Bilateral involvement is exceptionally rare and has been reported only in few cases in the literature. ,, CLE usually results in progressive respiratory distress in early infancy,  and it often presents a diagnostic and therapeutic dilemma. We report a case of bilateral CLE in a 2-month-old male infant presented with acute respiratory distress. In this report, the presentation, diagnosis, and surgical management of this rare condition are discussed. A 2.7-kg male infant who was born normally at term with no antenatal care presented at the age of 15 days with cough and respiratory distress that required hospitalization. He was treated as acute bronchiolitis (positive direct fluorescent antibody (DFA) testing for Respiratory Syncytial Virus) for one week; and then was discharged home fairly well. He was readmitted two weeks later with continuing breathing difficulties. On admission, he was found to be tachypneic at a rate of 65-70/min, pulse rate of 167/min, and blood pressure of 84/50 mmHg. His temperature was 36.4°C and his O 2 saturation was 92 to 94% on room air. Chest examination revealed subcostal and intercostal retractions, decreased air entry in both sides with expiratory wheeze bilaterally. Rest of systemic examination including cardiovascular examination was within normal. Infant was supplemented with oxygen, intravenous fluids, and a trial of inhaled bronchodilator. Respiratory status worsened significantly and infant was transferred to our pediatric ICU where he was intubated and mechanically ventilated. 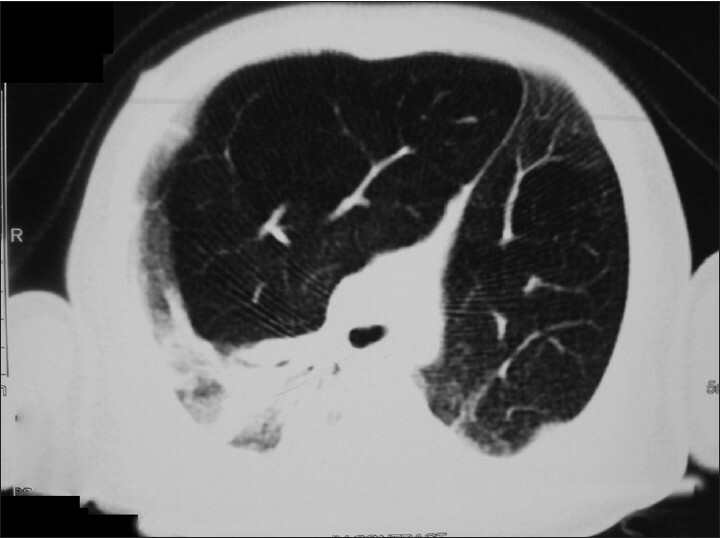 Plain chest X-ray of the first admission and the second admission [Figure 1] revealed marked hyperinflation of the right middle lobe and to a lesser extent the left upper lobe, with atelectatic changes of the adjacent lung lobes. These persistent findings raised the possibility of CLE. High-resolution CT scan of the chest was done and revealed emphysematous changes in the right middle lobe and left upper lobe with mild displacement of the mediastinum to the left side and atelectatic changes of the ipsilateral remaining lung lobes [Figure 2]. Flexible bronchoscopy showed bronchomalacia affecting the left main bronchus and bronchus intermedius. Echocardiography ruled out cardiac anomalies. Viral respiratory studies were negative. Infant continued to do poorly on mechanical ventilation, and after consulting with pediatric surgery, surgical intervention in two sequential operations to remove the affected lobes was agreed on. Because the right middle lobe was occupying most of the thoracic cavity and causing mediastinal shift to the left, right thoracotomy was performed first. The right middle lobe looked emphysematous at time of resection. Postoperative chest X-ray showed expansion of the right upper and lower lobes, and as expected, the left upper lobe emphysema became more pronounced [Figure 3]. At this stage, the infant continued to require ventilatory support, and five days later, left upper lobectomy was performed. The left upper lobe appeared emphysematous as well at time of resection. Histopathological examination of the excised right middle and left upper lobes revealed changes consistent with CLE in both lobes [Figure 4]. On day three post resection of the left upper lobe, the infant was successfully extubated to CPAP for few days and then to room air. Tachypnea and retractions significantly improved with good and equal air exchange in both sides of the chest. 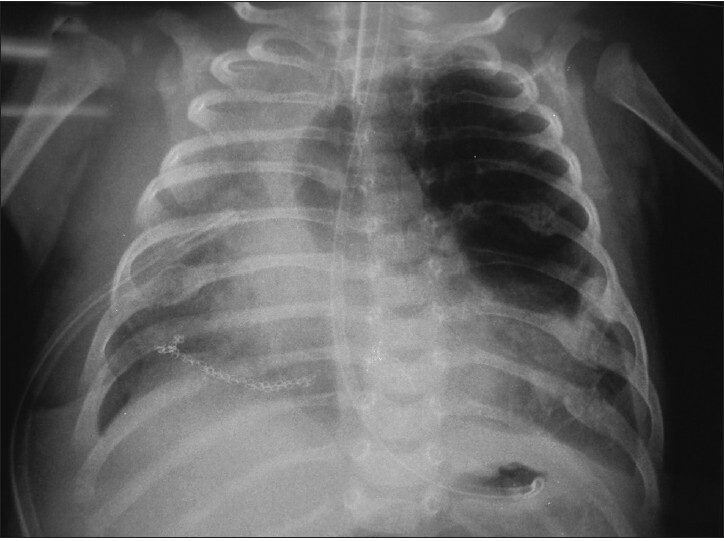 At time of discharge, 14 days post first surgical intervention, chest X-ray revealed good bilateral lung inflation with no residual atelectasis, emphysema, or mediastinal shift [Figure 5]. Our infant was seen as an outpatient at 2 and 6 months of age. He had normal O 2 saturations in room air and his respiratory rate was 40 to 45/min. He was feeding well and gaining weight. In our case, the patient presented in the neonatal period with signs of respiratory distress that was progressive and required PICU care and mechanical ventilation. 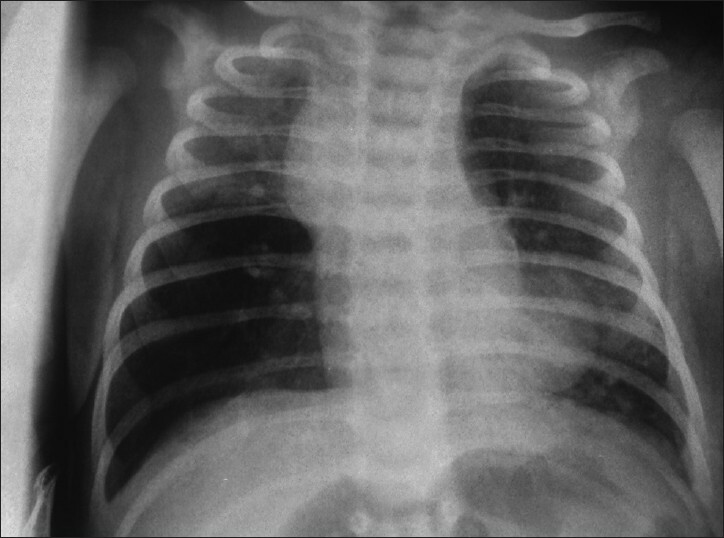 Bilateral CLE, although rare, should be considered in the differential diagnosis of respiratory distress in newborn period and early infancy, particularly if the chest images supporting this possibility as in our case. Management of CLE is usually resection of the affected lobe,  but in asymptomatic and mildly symptomatic patients, conservative approach is warranted. Surgical approach of bilateral CLE is controversial. Some reports are advocating the two-step sequential resection of the emphysematous lobes, , while others support the one-step operation in which the affected lobes are excised simultaneously. , Considering that our infant was in acute respiratory failure and on ventilatory support, and taking into consideration that simultaneous bilateral thoracotomy is considered to be a high-risk procedure with significant postoperative pain,  we felt that the two-stage surgical approach was safer. The right middle lobe was removed in the first operation as it was the most offending lobe. This was followed 5 days later by left upper lobectomy. We felt that our infant, who presented with severe respiratory embarrassment, tolerated well sequential thoracotomies with excellent outcome. 1. Abel RM, Bush A. Congenital Lung Disease. In: Victor Chernick, Editor. Kendig's disorders of the respiratory tract in children. 7 th Ed. Philadelphia. Saudners; 2006. p. 280-316. 2. Floyd FW, Repici AJ, Gibson ET, Mcgeorge CK. Bilateral Congenital labor emphysema surgically corrected. Pediatrics 1963;1:87-96. 3. Ekkelkamp S, Vos A. 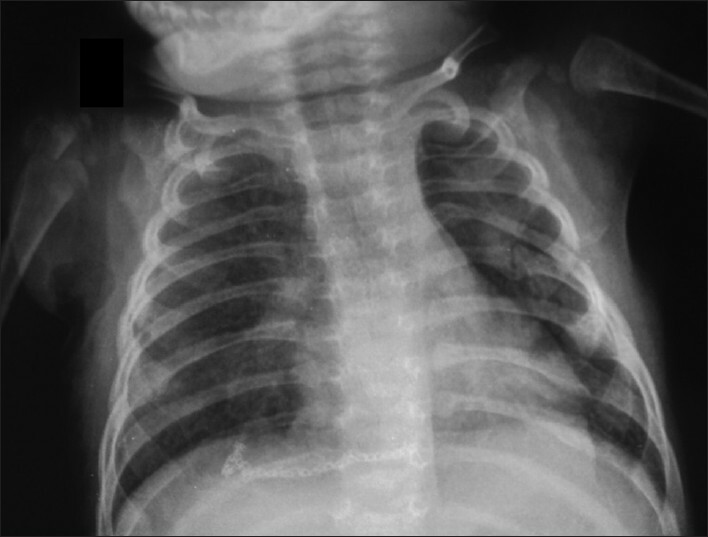 Successful surgical treatment of a newborn with bilateral congenital lobar emphysema. J Pediatr Surg 1987;22:1001-2. 4. Iodice F, Harban F, Walker I. Anesthetic management of a patient with bilateral congenital lobar emphysema. Paediatr Anaesth 2008;18:340-1. 5. Kravitz RM. Congenital malformations of the lung. Pediatr Clin North Am 1994;41:453-72. 6. Parray T, Apuya JS, Abraham E, Ahsan F, Shah S. Anesthesiologist's dilemma in a patient with congenital lobar emphysema. Internet J Anesthesiol 2010;24:1. 7. Bush A. Prenatal presentation and postnatal management of congenital thoracic malformations. Early Hum Dev 2009;85:679-84. 8. Choudhury SR, Chadha R, Mishra A, Kumar V, Singh V, Dubey NK. Lung resections in children for congenital and acquired lesions. Pediatr Surg Int 2007;23:851-9. 9. Mei-Zahav M, Konen O, Manson D, Langer JC. Is congenital lobar emphysema a surgical disease? J Pediatr Surg 2006;41:1058-61. 10. 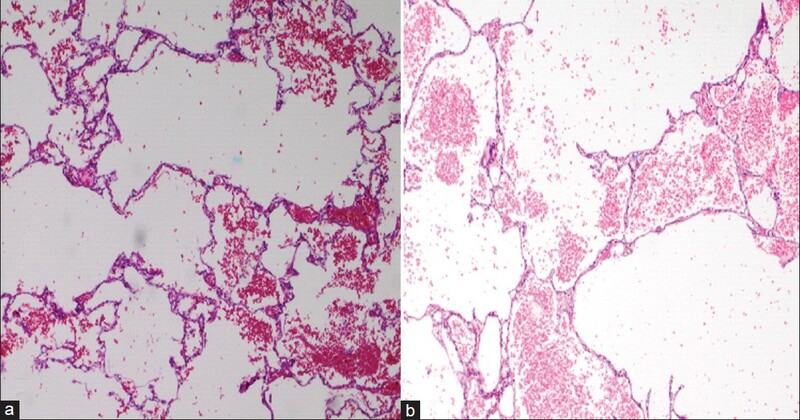 Maiya S, Clarke JR, More B, Desai M, Parikh D. Bilateral congenital lobar emphysema: How should we proceed? Pediatr Surg Int 2005;21:659-61.